← Flipboard Magazines: Self-Publishing or Content Composting? UPDATED AGAIN (5/9/2013): This morning Flipboard released an upgrade to its Android app, adding magazine creation and interesting new sharing options, including sharing photos from your phone/tablet Gallery. Flipboard also announced the availability of a web-based Editor (http://editor.flipboard.com) which allows editing and managing your Magazines from a desktop computer — it looks like the the portent of a possible Web version of Flipboard. 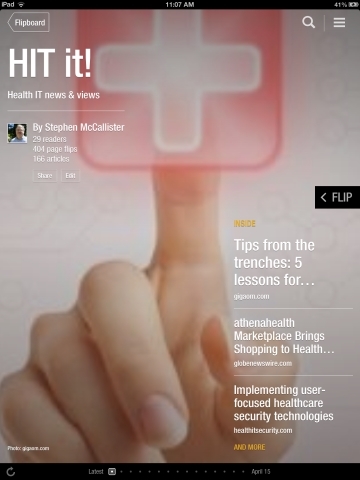 It’s been a few weeks since Flipboard introduced its Magazine functionality and since I started my Health IT magazine “HIT it!” Thus, it’s about time for me to update my original article and observations from the care and feeding of “HIT it!” Spoiler: it’s working very well for Flipboard, and I have continued to keep “HIT it!” going. Flipboard is very happy, obviously, with the high volume and variety of Magazines that have already been published. These include not only Magazines from individuals, but special purpose Magazines from established publishers (e.g., a Beatles magazine from Rolling Stone.) Popular topics for magazines include cities, stories in the news, photography and art, and professional information (e.g., HIT it!) Interesting uses include publicizing special events, such as conferences. Obviously there’s an enormous, growing variety of Magazines out there, a trend which will no doubt continue with an updated Android app. Creating a Magazine is easy, easy enough that a fair number will be created and abandoned as their authors lose interest. But a key thing about maintaining a Flipboard Magazine is that once you get it set up — and set up browser bookmarklets — it’s very easy to maintain. It’s well worth spending the two minutes or so it takes to install the bookmarking capabilities on your tablet, laptop, and desktop browsers. In fact, without doing this, you probably won’t succeed in maintaining your Magazine. Thіs will go a long way toward reducing the number of orphaned Magazines. One area where I would like to see improvement is around comments. When you “flip” an article to the Magazine, you are allowed to enter comments, but the display of comments within the Magazine is fairly limited. When the reader selects an article, a tweet-like frame appears at the bottom of the page as the article is displayed. When I say “tweet-like,” I mean that only a couple lines of text are displayed, and the user has to click or touch the footer to read the entire comment. The greatest value of Magazines is likely to be that they curate content, so finding a way to display comments better would be a value-add for readers. There is a way around this limitation, which I am using now. If you have a blog or can post on another website, then your own comments can appear as articles within Magazines. This works well enough for many of us, but a more straightforward means of enabling “editorial” content would be another step forward for Magazines. Not knowing whether I would continue the HIT it! experiment, I didn’t initially promote it very much. Despite essentially zero promotion, a readership has gradually accumulated and I will soon move to promote it so more. Adding content to HIT it! has been surprisingly frictionless — and I really look forward to an updated Android app to make that even better. If you’ve had any experience with Magazines, as either a reader or creator, I’d love to hear your comments. This entry was posted in Health IT, IT, technology. Bookmark the permalink.